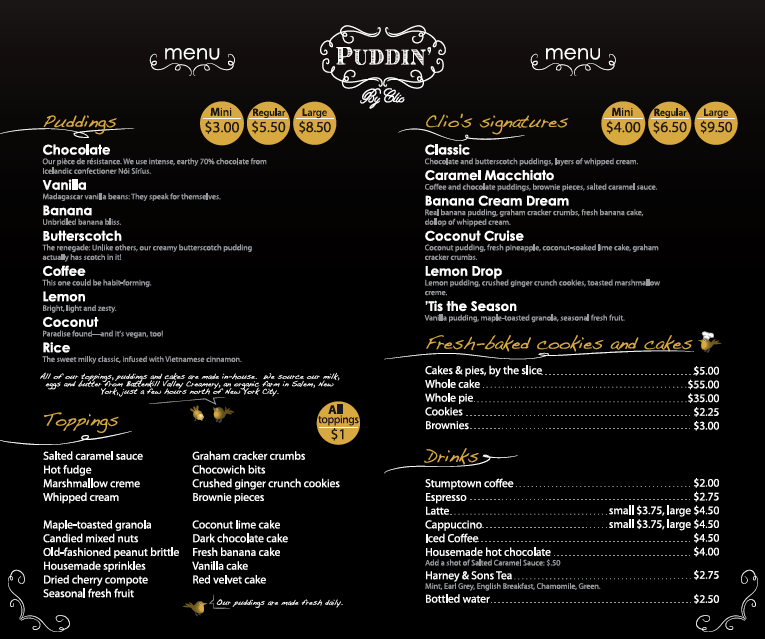 The menu at Puddin’I’ve got a brand new crush. He’s smooth, sweet and delicious and no, he’s not Ryan Gosling. OK, yes, I like him too, but this new love of mine is served in a cup. I’m talking about pudding from Puddin’ in NYC, in the East Village. DIVINE. I discovered this new storefront of deliciousness on a wonderful outing with some new friends this past Friday. Everyone was raving about Puddin’, got me into a silly state (doesn’t take much of course) where I kept calling everyone “Puddin’” in my best Southern accent, which just ain’t that good. Anyway, pudding from Puddin’ is that good. So what sets this freshly made nirvana of desserts apart from, say, Jello pudding? Well, for one, the dark chocolate is really dark, made from single source 70% chocolate from Icelandic confectioner Nói Síríus. The rice pudding is dusted with Vietnamese cinnamon and for their vanilla they use Madagascar beans. For those who may still be doubtin’, they offer toppings like Salted Caramel Sauce and Brownie Bits, as well as Coconut Lime Cake and good old fashioned whipped cream. Yeah, you get it now, don’t you?! All puddings come in mini, regular and large, which can fit all pocketbooks as well as all diets. A mini is the kind of indulgence that will satisfy a sweet tooth just enough to leave you wanting for more. And leave you feeling light on your feet. Puddin’ is located at 102 St. Marks Place (between First Ave & Ave A), in the East Village. Check out their website for more info, a full menu and directions. This entry was posted on Tuesday, May 15th, 2012 at 1:24 pm and is filed under Chocolate Corner, Food, Woman About Town.